Can the iPad be a viable navigation device? 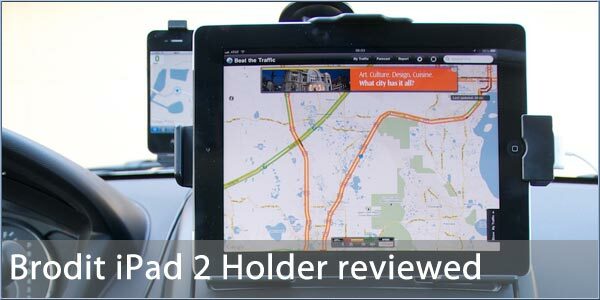 To find out I travelled thousands of miles using the iPad and one of the latest Brodit holders in a variety of rental cars. The experience was interesting, and I found that given the correct location in the car the iPad was a superb replacement for the traditional PND style navigation system! For the last couple of months I have been in the United States. One of the things I was testing out was navigation using the iPad. This was partly in response to a challenge from a household SatNav company telling me that the iPad was no good for navigation. From this you can surmise that they do not produce an iPad App. The two prerequisites for using the iPad as a SatNav are: navigation software; and a mounting solution. The mounting solution I was looking at needed to be portable as I was going to be using it in different rental cars. The other thing I needed to look for was some form of powering of the iPad. I was going to be driving for some long distances and couldn't rely on the iPad's battery to last when stressed out with Navigation, Audio, and the normal email etc all running. I looked around at the various offerings and settled on Brodit's iPad 2 Holder with Pass-Through Connector and a tilt/swivel connector. Brodit offer a wealth of solutions for the iPad 2 see here for details. I decided to go for the Pass-Through connector to allow me to use the TomTom High Speed Multi charger. This would allow me to charge my iPhone and another device with the same charger. I did need to use one of the many Apple iPod/iPhone/iPad charging cables that I own as this was not included. Brodit do actually make a number of 'active' mounts with either bare wire or cigar lighter connections, but I preferred the flexibility of the TomTom multi-charger. Having selected the holder and the charger I now needed to look at the mount for the car. As I was going to be using a number of different cars I could not go with my first choice which would have been the Brodit ProClip. Instead I looked at a windscreen suction mount. It had to be reliable and have a long reach. I decided to select a Herbert Richter Global 5 Tower system (part 1647) this gave me world class suction capabilities and an abundance of options for setting it in a secure position. I connected the two together using a Brodit four prong HR Adapter plate. The most important things about the holder and mount are that it should be stable and secure. It should also not obscure either the driver's vision nor any of the important controls of the car. This was where the long arm of the HR tower system came to the fore. The ratchet arm movement combined with the angled arm and holder adjustment allowed me to precisely locate the Brodit holder. For added stability I made sure that the whole ensemble was resting on the dash. The result of this was perfect visibility with rock steady support. In the pictures you see it installed in a Suzuki Kizashi, and a Kia Rio, but I also had it in a similar Hyundai, a Mitsubishi Galant, a Dodge MPV. In all of these cars the mount and holder worked fine with the only minor issue being that the clock was hidden in the Galant. I also have it mounted in my own Mercedes SLK. This proved slightly more of a problem as I have only a small space for it to fit and lots of tech in my car. When I have my iPhone mounted I have to have the iPad in portrait mode and there is no access to the Bluetooth controls or some of the radio controls. These were only minor points as I don't use the radio at all and the Bluetooth is controlled from the iPad/iPhone once the volume has been set. The iPad was also marginally less stable in the SLK as it was attached to the car by just the central tilt/swivel point as opposed to resting on the dash as well as tilt/swivel mount. I am not suggesting that the Brodit mount or iPad will suit every car, but of all the ones that I have tried I have not had any problems. The main concerns are not to mount it over an airbag, and not to mount it too high as to obscure the drivers line of sight. In fact the lower the mount point the less the iPad will suffer from reflections. The iPad is located in the two lower grooves of the Brodit holder, then clipped into the upper groove. Once firmly gripped in the holder the iPad is slipped over into the connector to make the electrical connections. When finished and ready to remove the iPad simply reverse the process. The important thing is to remember to slide the iPad away from the connector otherwise it will not come out. This is slightly more difficult to do when the iPad is in portrait mode, but easier to connect to the power as gravity helps seat the iPad. There is one thing to be aware of when removing the iPad from the Brodit holder and that is that you do need to slide it out of the Apple connector. I forgot to do this on a number of occasions and wondered why it didn't come out easily. In use the Brodit and HR combination was as close to perfect as one could wish for a portable solution. Whilst driving the iPad did not suffer from vibration, and was always solid and steady. The ideal mounting position was always between driver and passenger giving good viewing from both locations. There were some slight issues with reflections particularly when the sun was low in the sky but no worse than with any other device, in fact the low mount position actually helped reduce reflections a lot. In the permanent mounted position in the SLK there is a little movement caused by the large device, single mount point, stiff suspension and the poor condition of some roads. However this is not excessive and is more than adequate. Currently there are only 2 real turn by turn navigation applications to use on the iPad, Navigon and CoPilot HD, though more are coming soon. During my testing CoPilot released a new version of the iPad app CoPilot Live Premium HD which I did not get the chance to use. Both the applications provide good routing as we have come to expect and take advantage of the larger screen to display more information about your journey. I will cover these applications in more detail in a later article, but there was certainly a much better experience whilst driving in unfamiliar territory. The sheer size of the display makes understanding where you are and where you are going much easier. All it takes is just a glance to determine very clearly what you should be doing. As I am getting older I am starting to find that even some of the larger screen PNDs are not as easy to read as they used to be, and when travelling with the PND on the windscreen 3 feet or more away in bright sunshine it is often impossible to see. Up until recently I have raved about navigation on my iPhone. I still love it but the iPhone has let me down on more than one occasion. The last example was the new iPhone 4 when mounted in the TomTom holder on the windscreen in Florida will simply overheat and initiate a thermal shutdown. This last trip has been very typical of a hot Florida summer with temperatures in the mid to high 30s for 8 weeks. During this time my iPhone simply failed me, becoming a very hot piece of glass. The iPad however benefited from being further away from the effects of the sun and worked perfectly for every one of the 5,000 miles that I travelled. So the conclusion is that the iPad when coupled with the Brodit mount is an excellent proposition for navigation and also as an entertainment system for those in the back seats. As a call to action I would like to see more SatNav companies release proper navigation applications that can make full use of the extra real estate of the iPad to give us an even better SatNav solution. Interesting review, I had short foray with a 10.1" Superpad Android running Navigon but unfortunately wasnt impressed with the resistive screen or Navigons lack of functions (maybe bad install or lack of memory in the Superpad) but was most impressed with the full screen display on the HD screen and showing very clear road names, subsequently moved up to The Acer A500 32GB Android but havent reinstalled Navigon mainly because My Asus/ttn7 fullfills my mobile needs at the moment and perhaps the main contenders like Copilot,Navigon and Sygic are still to improve especially around third party POIs, not sure if Aura is compatible with the A500. I have to agree with your conclusion that the large screen tablet Nav packages could do with some extras to take advantage of the large HD displays increasingly coming onto the market. I already use and like the brodit proclip/swivel in vent surround mount for interchanging phone and satnav but rather concerned that too much weight for the Ipad or the slightly heavier Acer and second concern is that manufactures will not bother making holders etc for tablets other than the Apple. No doubt even more drivers will now be able to play on the internet / read emails etc or watch television or a film whilst they are driving! Only irresponsible drivers would think that way. Yes but there seem to be quite a few of them about. I have followed two cars in the last couple weeks with some form of tablet pc lodged on the dashboard with what seems like television or a film playing and certainly was not for the passenger as the driver was the only person in the car. It's at times like that when I wish I was a unmarked police patrol car!